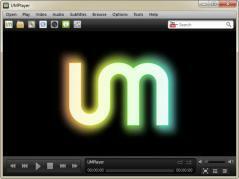 The software market is flooded with free media players, but only few of them can compete with UMPlayer. This free media player has a comprehensive built-in codec collection so it can play anything! From audio and video formats to Audio CDs, DVDs, (s)VCDs, YouTube streams and others, UMPlayer can handle them all flawwlesly! It even plays damaged or incomplete files. - Includes a wide array of advanced features such as support for UI skins, subtitle search function, sync option for audio/subtitles, optimized filter rendering....etc. - Supports all media formats such as AVI, DivX, Matroska, MP3, MP4, WAV, WMA, XviD, Audio CDs, DVDs, (S)VCDs, TV/Radio cards and many more!